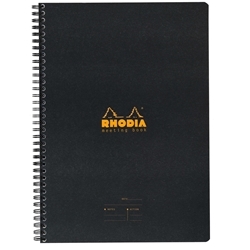 Rhodia Meeting Book A5 - 6.3"x8.3"
Home / Paper → Journals → Wirebound → Rhodia Meeting Book A5 - 6.3"x8.3"
Invented by a CEO for his own use, this notebook is designed to be an all-in-one record of meeting discussions, decisions and action items. Easy to review at one glance, with space for action items and room to organize notes on the side, it is an effective tool for efficient meetings. This wire-bound book contains 80 sheets that are pre-printed pages with the date and sections for notes and action.